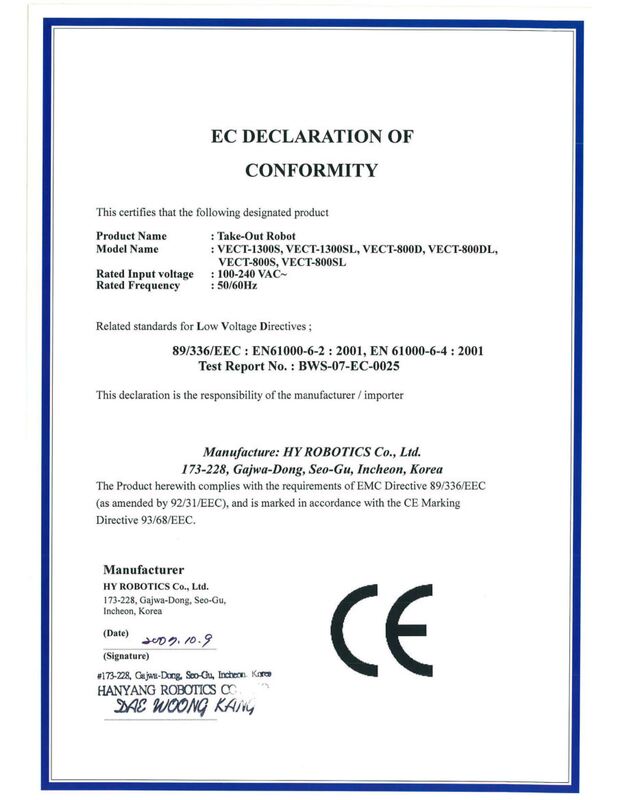 We hereby certify that the products listed on this certification are original factory made products and are in conformity with the technical specifications declared by the manufacture. 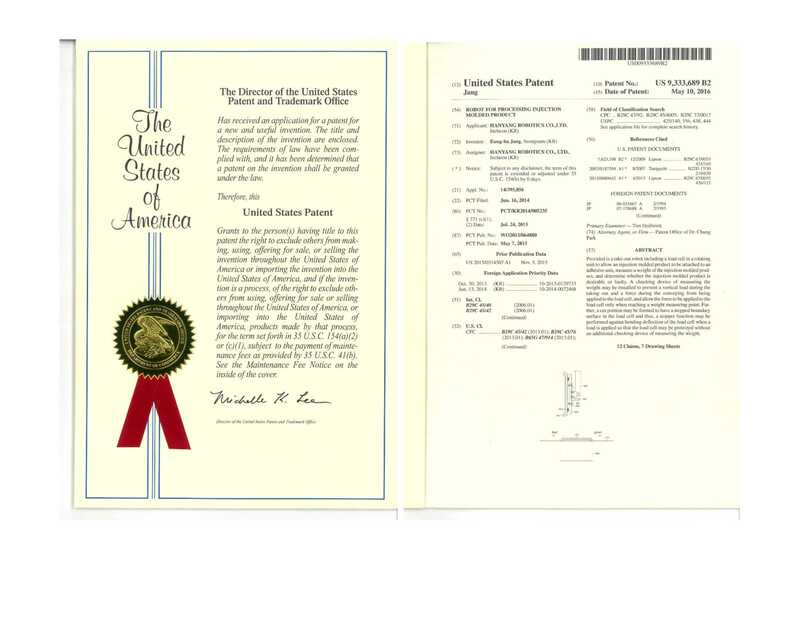 USA Patent for Weight mesurement system ! 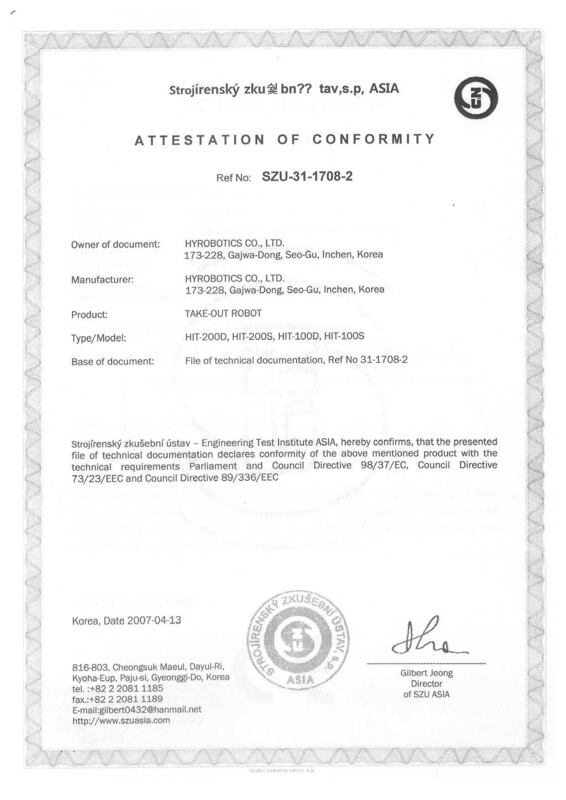 HYRobotics manufacturing plant is certified with International Standard Organization 9001: ISO 9001. ISO 9001 Certified plant is manufacturing products with optimum process to improve it's quality to satisfy their customers. 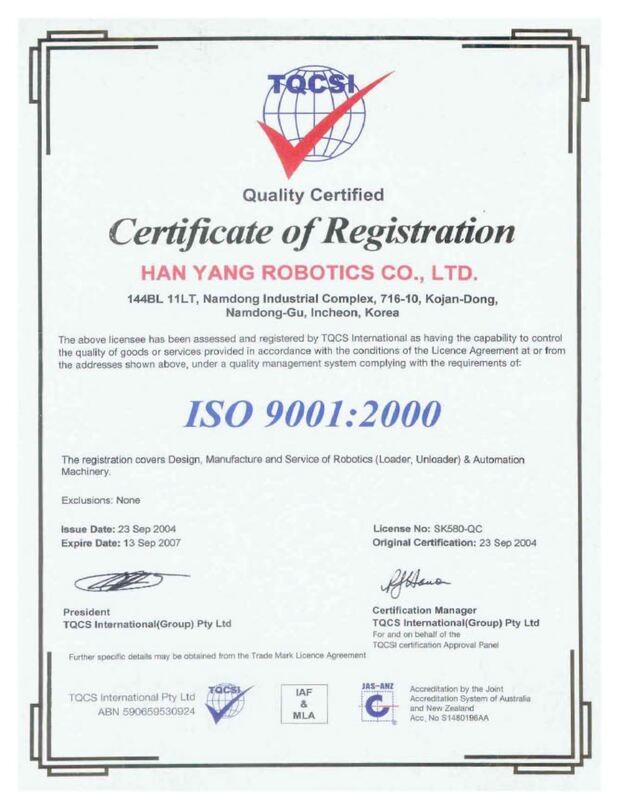 ISO 9001 Certified production will ensure each component of robot inspection form supplier , control process for manufacturing and test finished products with step by step of ISO 9001 Certified Step. 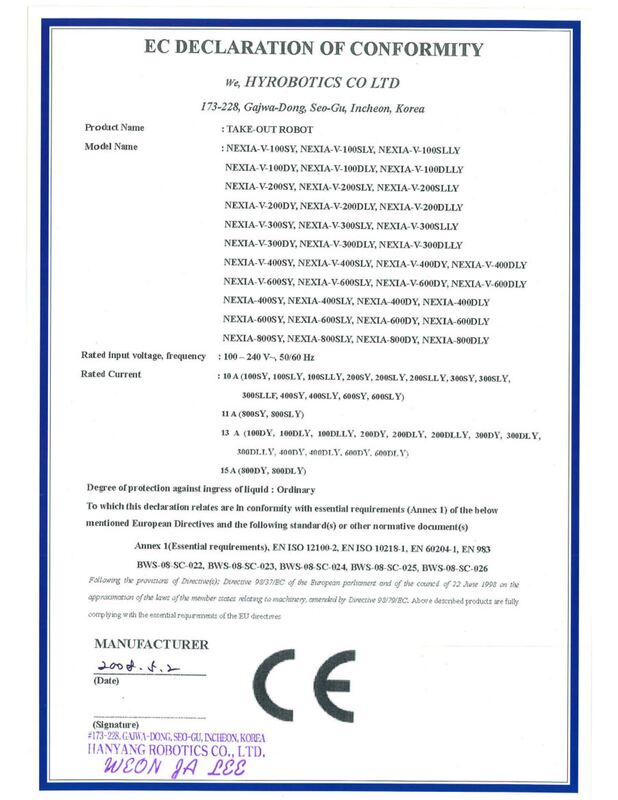 In this document the manufacturer or authorized representative declares that the machinery is designed and built according to all applicable European safety standards. It has to be pointed out that all requirements mainly apply to the safety of the machine and not to the entire technical system and technology. Safety means safety of persons, of the environment, of goods. For the purpose of the directive, 'machinery' means an assembly of linked parts or components, at least one of which moves, with the appropriate actuators, control and power circuits, etc., joined together for a specific application, in particular for the processing, treatment, moving or packaging of material. The directive does even apply to machinery that are not stand alone systems. The term 'machinery' also covers an assembly of machines which, in order to achieve the same end, are arranged and controlled so that they function as an integrated whole. The individual components of the machinery do not have to carry the CE Mark. However, some separately sold components ("safety components, placed on the market separately") will need to bear the CE Mark. Additionally the EMC (electromagnetic compatibility) Directive 89/336/EEC has come into effect since January 1st, 1996. Manufacturers must ensure their products conform to this strict directive. Not only must they not emit electromagnetic disturbances, they must also be immune to them. Any electrical product that could be construed as having an intrinsic purpose (i.e. 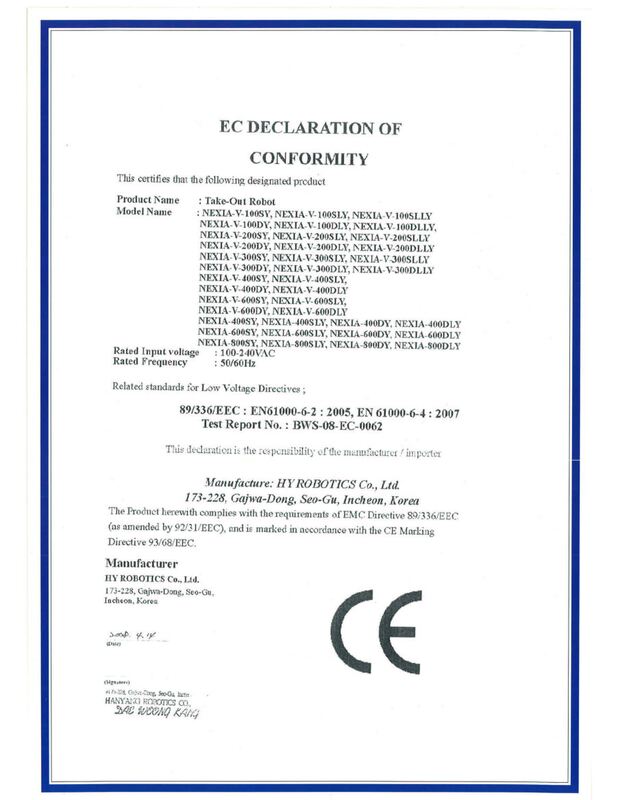 is not simply a component), will have the CE marking to indicate conformity. What CE standards are applicable for machinery? What standards your machine has to comply with depends on the machine itself and its use. The standards are so numerous that usually a database search is required. A harmonized standard is a standard which is harmonized for use in all member states. The manufacturer retains the responsibility for certifying the conformity of their machinery to the relevant essential requirements. Conformity to harmonized standards creates a presumption of conformity to the relevant essential requirements. It is left to the sole discretion of the manufacturer, where he feels the need, to have his products examined and certified by a third party. The manufacturer is under an obligation to assess the hazards in order to identify all those which apply to his machine; he must then design and construct it taking his assessment into account. The assessment is to be recorded and included in the construction file. 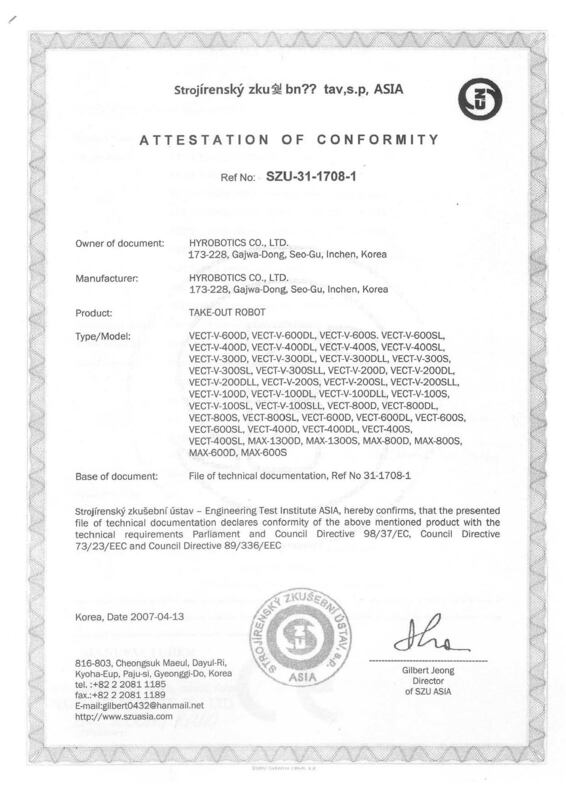 Before issuing an EC declaration of conformity it is essential that the manufacturer or his authorized representative provides a technical construction file. It is not, however, essential that all documentation be permanently available in a material manner but it must be made available on demand. If a competent national authority asks that full documentation be presented, it will suffice that this documentation is compiled and made available in a reasonable time frame. The documentation need not include detailed plans of the subassemblies used in manufacturing the machines, unless knowledge of these is indispensable in order to ascertain conformity with essential safety requirements. full detailed drawings, accompanied by any calculation notes, test results, etc required to check the conformity of the machinery with the essential safety and health requirements. a copy of the instructions for the machinery. The above construction file has to be in any one official language of the EC and will be accepted in other EC countries as well, even if a different language is spoken there. The maintenance manual may be required in local language; this differs from case to case, see below. The operating manual is always needed in local language. You will find this info in the EC directive 89/392/EEC amended by directive 93/44/EEC Annex 1, 1.7.4: "... On being put into service, all machinery must be accompanied by a translation of the instructions in the language of the country in which the machinery is to be used and by the instructions in the original language. .... By way of derogation of this requirement, the maintenance instructions for use by specialized personnel employed by the manufacturer or his authorized representative established in the Community may be drawn up in only one of the Community languages understood by that personnel." If the manufacturer does not reside in the European Community, directive 89/392/EEC requires that he must name an authorized representative established in the EC. This representative noted in the EC declaration of conformity must be capable of making the construction file available to competent authorities on demand. How does the CE marking become enforced? The member states of the European Community are free to choose the way how and when to check whether a machinery is bearing the CE Mark. Thus each state does it differently through "competent authorities". Generally no standard procedure exists to check on the machinery and it may never be checked at all. 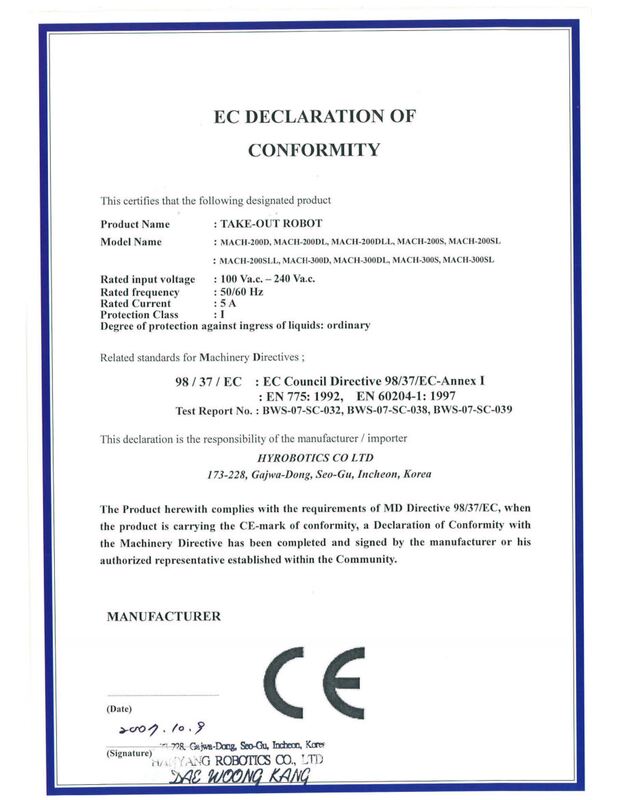 The rule for the latest moment to affix the CE Mark and for issuing the EC declaration of conformity is: The machinery has to bear the CE Mark at the moment it is given to the user. For standard machinery this may be the time of purchase or delivery. For special designed equipment or equipment which is assembled at the customers site, this may be the moment after having set up the machinery and having put it into operation by the manufacturer and handing it over to the user. To sum it up: you never know, when you will be checked. 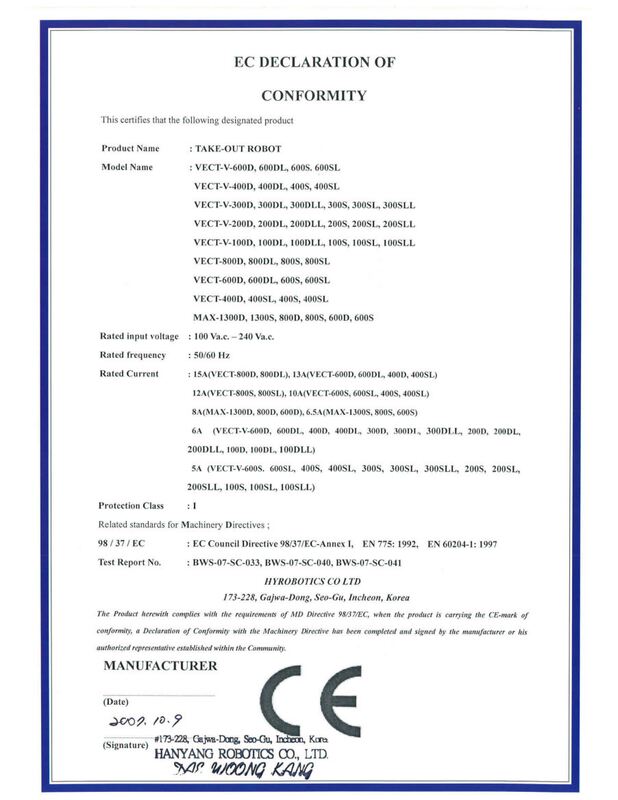 It may be possible to use/sell machinery without CE marking unnoticed for quite a while. But the user/seller will be in bad shape, if an accident happens or if he is subject to a routine check. 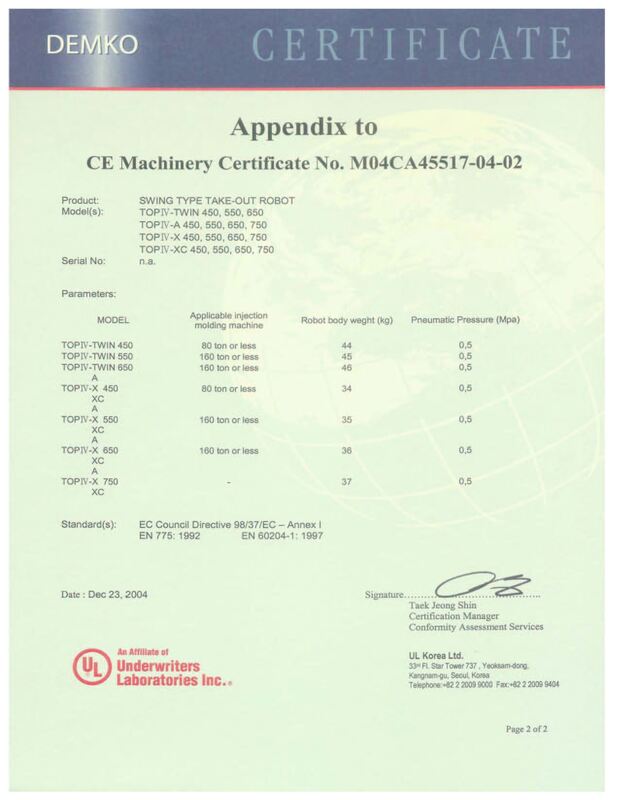 If the machinery bears the CE Mark, local authorities may ask for the construction file, which is required before issuing the EC declaration of conformity. The file has to remain available for at least 10 years following the date of manufacture of the machinery. The documentation has to be delivered in a reasonable time frame, e.g. 7 to 14 days, depending on the type of documentation. Failure to present the documentation in response of a duly substantiated request by the competent national authorities may constitute sufficient grounds for doubting the presumption of conformity with the requirements of the EC directive. Make a database search for all European standards which are applicable to your machinery. Check your equipment against these standards, make a safety analysis (hazard assessment) and keep a written record of this procedure. Make changes to your equipment if required by the above analysis. Localize the operating manual and if necessary any maintenance manual. State herein the safety rules with which the equipment complies. Give notice in the manuals for which purpose the equipment is built. Give notice which safety hazards may arise and how to avoid them. A fast, safe, and economical way to ensure you are fulfilling the CE Mark requirements is to employ local expertise in this field, to guide you through the necessary actions to be taken. BICON provides all services needed. Please refer to our list of those services designed to help you to get started fast and smooth.